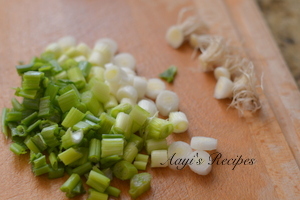 Green onions or scallions or spring onions or Kande patti is a seasonal and loved delicacy in my hometown. My dad loved it a lot and aayi would make kande tambli whenever we found this in market. Few years back, I sat down with V’s grandmom to collect some of her signature recipes. 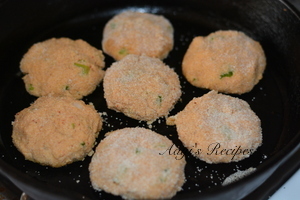 Kande patti vade was one of the recipes she shared with me. She passed away two years back and I am grateful for the few recipes I saved from her. I loved her enthusiasm in cooking even during the old age when she couldn’t move from her place, let alone cook. 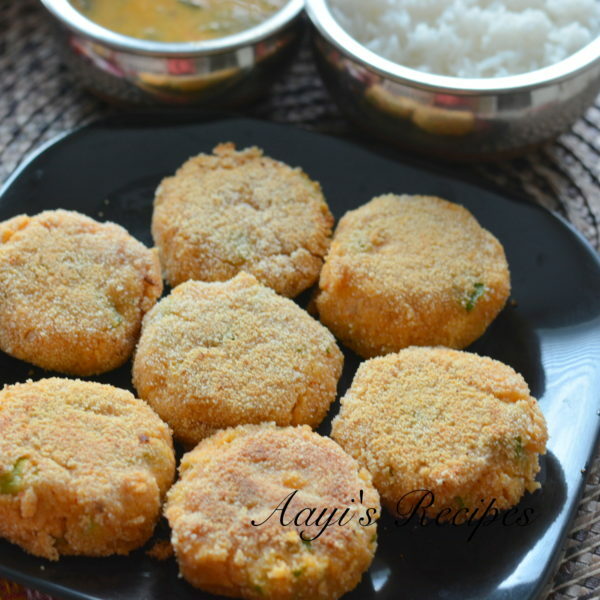 I rarely buy kade patti but this dish kept popping in my head and I thought of finally making it. 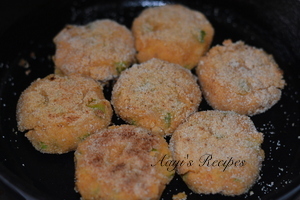 The vadas turned out to be delicious and even 7 year old loved it. 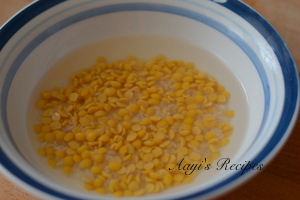 Soak toor dal and rice in water. 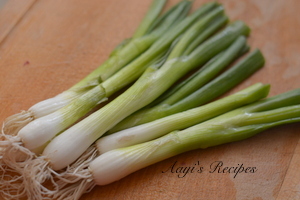 Cut spring onions. 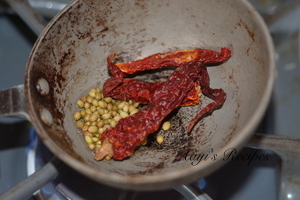 Fry coriander seeds and red chillies. 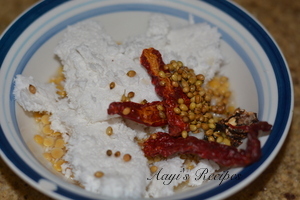 Grind with coconut, dal and rice. 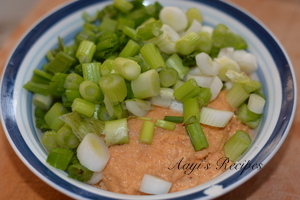 Then mix spring onions. 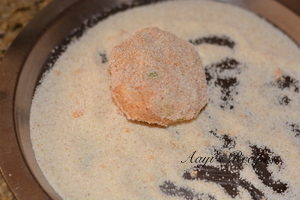 Make small balls and roll in rava. Shallow fry on a hot tava. Thanks for the very good recipe. Hi here after a long time. 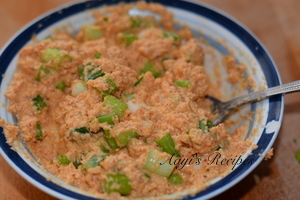 I like this recipe n plan to make it. Thanks it’s simple yet delicious. Can we add methi leaves or palak leaves instead of spring onions ? Shilpa ji.. Thnq u so much for ur recepies. Nimmalli annapoorneshwari amsha idey. Nim big fan nanu. Since approx 4 years i know ur site. Neev nangey role model idda hagey. Nan hecchu recepies na try madilla. Due to time constraint. Nim baggey yelar hatranu heltha irthini. In coming days nan try madthini. Neevu please siri danya gala baggey recepies na try madi please. Navaney, arka,udalu , koraley, samey.